The Haase Quartet was formed in the fall of 1999 by Peter Haase of the National Symphony Orchestra and his student Julia Sun. 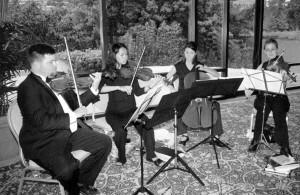 Since their first performances together the quartet had the opportunity to perform in weddings, receptions, ceremonies, and events. The quartet has performed at the Kennedy Center, Hermitage Foundation, Watergate Hotel, Fairfax Town Hall, churches and more. The quartet has performed in master classes with the Shanghai Quartet, the Orpheus Chamber Orchestra, The Ying Quartet and The St. Lawrence String Quartet. The quartet studied with the Lydian String Quartet at the 2001 Lydian String Quartet Summer Music Festival in Waltham, Massachusetts. The ensemble was feature in the 2001 Fairfax Spotlight on the Arts and was also filmed for a scene of the movie “Hannibal”. The Haase Quartet is an experienced and eloquent chamber group that brings professionalism, creativity, and affordability to your special event. The quartet has been serving as the “go to” ensemble for the Metropolitan D.C. area for over twelve years and has created a tradition of excellence that will find its expression in your wedding, reception, party or corporate event. The Haase Quartet takes pride in adding a personal touch to each of our performances with music for every taste and style and we look forward to working with you to craft a musical experience specific to your needs. We give the very best every time because we know that for your event nothing else will do. Please contact us! Your special occasion starts today!